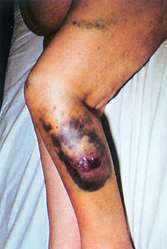 a hemorrhagic spot, larger than a petechia, in the skin or mucous membrane, forming a flat, rounded or irregular, blue or purplish patch. (See Atlas 2, Part R.) adj., adj ecchymot´ic. bluish discoloration of an area of skin or mucous membrane caused by the extravasation of blood into the subcutaneous tissues as a result of trauma to the underlying blood vessels or fragility of the vessel walls. Also called bruise. Compare contusion, petechiae. The medical term for a bruise. Ecchymoses may develop around the eyes following a nasal fracture. In the differential diagnosis of recurrent ecchymoses and bleedings, this condition should also be considered and the patients should be examined carefully in terms of association of hematological and other diseases. 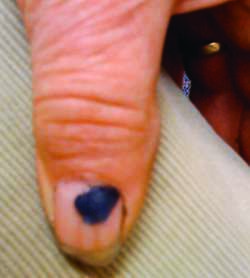 The primary clinical feature of psychogenic purpura reported in the literature is recurring ecchymoses. The peri-umbilical and flank ecchymoses are common in rectus sheath haematoma. The second study, a 2009 ASLMS abstract, entitled: "A Simple Solution to a Common Problem" evaluated the effectiveness and safety of the long-pulse PDL (the Vbeam) for the treatment of ecchymoses. Ecchymoses usually develop in childhood; epistaxis, postoperative hemorrhage and gingival bleeding may be observed. These purplish discolorations may range from tiny dots known as petechiae to larger patches known as purpuras to even larger ones known as ecchymoses. It is characterized by development of painful edematous skin lesions that progress to ecchymoses during the following 24 h (5). The characteristic cutaneous findings of scurvy are follicular keratotic papules and perifollicular hemorrhages, purpura, and ecchymoses. The most common adverse events observed during the double-blind, placebo-controlled portions of three clinical trials in patients with psoriasis were infections, injection-site reactions, headaches, and injection-site ecchymoses. Physical examination disclosed mild icteric sclera and multiple ecchymoses on the extremities. The cutaneous damage from radiation injury may manifest as ecchymoses, petechiae, bullae, epidermal sloughing, ulceration, hair loss, hyperkeratosis, and stochastic radiation reactions with long-term carcinogenesis. One patient presented with petechiae, one with simple ecchymoses, and one with noninflammatory retiform purpura.